While we've been happy to report the continuing resurgence of 3DS sales in Japan, it looks like success in the UK is proving to be more difficult to achieve. In the latest software charts published by UKIE only one 3DS exclusive, Mario Kart 7, has managed to steer its way into the top 20, sneaking in at 19th place. Super Mario 3D Land jumps onto the platform at 24th, while Resident Evil Revelations is nowhere to be seen, having dropped from 6th place in two weeks. Wii titles Mario Kart Wii and Wii Fit Plus sneak into the top 40, probably by virtue of being part of hardware bundles, and Professor Layton and the Spectre's Call represents the only DS entry. 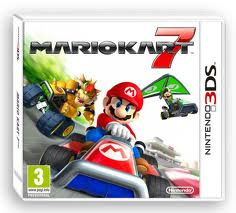 Nintendo platforms, particularly 3DS after a lot of marketing activity, are struggling to burn up the UK charts. It seems that a lot of these gamers still need to be won over. Poor marketing and advertising. Only focusng on Q4 period. At least I'm safe in the knowledge that Call of Duty Modern Warefare (What number are we on now?) is rooted at number 7... shame it can't fall down a few numbers. Also the prices, it's good dropping the console price down but if it's still £35 for MK7 in GAME then that will put people off. D: I hope sales get better as the year goes by. And to think you people are getting the Last Story. Though its not like 3DS software sales are doing great in America either. I do agree with above that titles cost too much retail wise. Well Nintendo don't advertise in that much in the uk so it's there own fault,at least Japan and NA are doing better! I suggest people give Nintendo more credit and more of a chance than they have been. So, once again, there's what, one or two million 3DS' in circulation in England (if that), against tens of millions of Wiis, PS3s and Xbox 360s. Yeah, it's clearly the advertising that is the reason the 3DS software sales is comparitively low. Good to know there are so many executives on Nintendolife to let us know that! When some of the big titles launch Nintendo will get some games in the top 20s and the 3DS sales will shoot up. The problem is they don't have a balanced release schedule. With what 4 big launches just before Christmas and not any more for another month they can't expect a whole lot of sales. UK gamers are too busy buying up copies of Fifa 12 & Zumba fitness that's why! I barely ever see any adverts for any of the 3DS games on the TV? plus i haven't seen any resident evil revelation adverts on the TV if no ones no's about it then no one's gonna buy it! I think it's a concern, purely from a UK perspective, that a console that is quite new to the market and should be attracting a lot of hype just doesn't seem to be doing so. @ChocoGoldfish - If you think about it this way, Resident Evil Revelations has dropped out of the top 40 after just 2 weeks, meaning a large proportion of the user base don't want it, or haven't been convinced that it's worth a purchase. There's simply not enough excitement about 3DS in the UK right now. I don't get why everyone's going on about the UK only buying crap, it's the exact same story in the US, if not worse. Also, Waltz has a valid point. @15 - Think about it this way - what percentage of people buy even the most popular games on other consoles. There's 100 million odd DS' that were sold, right? Did any game even crack the 10 million mark? Resident Evil was never going to appeal to every single 3DS owner - it's a horror game. That's a niche genre by default. "Quality" or not, people can't be compelled to buy a game they're not interested in. That goes for every single game though - the number of games that sell to even 10 per cent of a console install base would be a very small, exclusive club. And frankly, Revelations isn't THAT good that it belongs in that club. I only just noticed that the comments no longer indicate the commenter's country. That's a bit of a pity. Odd thing is UK had some of the best 3DS hardware sales during the launch period of the 3DS. In what can be called a rarity, the 3DS sold better in UK then in Japan or America early on. Now oddly enough, games are starting to sell better in america and japan. Systems are selling better. It is the UK that has cooled down at least on game sales anyway. . There's simply not enough excitement about 3DS in the UK right now. There isn't any excitement about the 3DS anywhere. It had a terrible launch and had a couple of big titles rushed out for last years holiday season that were compromised as a result. There is little to no reason to settle for less when Nintendo's next gen console will offer a breath of fresh air along with something a little less gimmicky. @Chiptoon: Yeah, just noticed this too. I'm liking the bigger, bolder site design... but I do miss the country icons. Always neat, and instructive, to see where people come from. Bring them back, NL? I think the NOA and NOE teams should change places. I think that the main problem with RE:Revelations sales performance is that you just can't buy it on the high street at the moment. I've been to a lot of different stores like HMV, Game, Gamestation, Smyths and Toy's R' Us but nowhere stocks it. A lot of gamers buy from the high street and even rely on trading to afford new titles or just impulse buy when they go in-store. I've not brought it myself yet as I've no time to play it but I may get it in the next few months. @Bankai How ever that is about anything like meeting a streetpass user at NHS as thats what happend to me.